Philadelphia Police and Fire Department are now investigating after they found an oil sheen floating on the Schuylkill River in Philadelphia. The oil sheen was spotted at around 4 p.m. yesterday on the portion of the Schuylkill River between the Spring Garden and Chestnut Street Bridges. The Philly Police are working to find where the spill happened. Some of Pennsylvania's highways will be getting a speed change over the next week. Crews will be changing the speed limit to nearly 1,000 miles of the highway to 70 mph. The changes will happen on 396 miles of the PA Turnpike, as well as 400 miles of five PA state highways. 200 miles of state highways were changed to 70 mph already in 2014. - I-79 from I-90 in Erie County, 97 miles south to just north of the PA 228 interchange in Butler County. - I-79 from I-70 in Washington County, 33 miles south to the West Virginia border. - I-80 from the Ohio state border, 190 miles east to a point near mile marker 190 in Clinton County. - I-80 near mile marker 195 in Union County, 52 miles east to a point near mile marker 247 in Columbia County. - US 15 from the interchange with PA 14 in Lycoming County, 49 miles north to the New York state border. - I-99 from Exit No. 68 in Centre County, 34 miles south to a point near mile marker 34 in Blair County. - I-99 from Exit No. 28 in Blair County, 28 miles south to the intersection with the Pennsylvania Turnpike in Bedford County. - I-380 from I-84 in Lackawanna County, 21 miles south to Exit No. 3 in Monroe County. A Philadelphia man known as Philly Jesus was arrested last night in Center City. 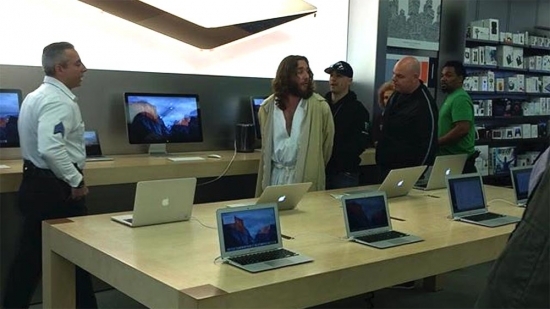 Philly Jesus, who's real name is Michael Grant was arrested last night in the Apple Store at 16th and Walnut. Police say that the store manager had called in saying that Grant would not leave the store after being asked. Police arrived on the scene and asked Grant to leave the store, he refused and caused a disturbance, which is when police arrested him for Defiant Tresspassing and Disorderly Conduct. The Phillies are in St. Louis tonight against the Cardinals. Today, Rainy, with a high of 62 in Center City.